This bidet tap offers the convenience of a pop-up waste and all-round ease of use making it ideal for a contemporary bathroom. This single-level mixer's ball-joint spout enhances your cleansing experience by letting you direct the water flow with precision. 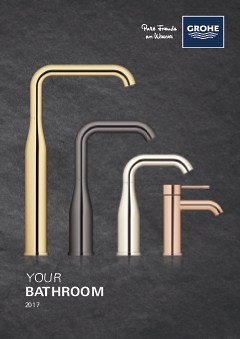 The GROHE FeatherControl feature lets you vary water temperature and flow to suit you. The EcoJoy feature caps your water use at 5.7 litres per minute thus reducing your household bills. You will use up to 50% less water without sacrificing flow. As well as ease of use, the GROHE QuickFix Plus system makes fitting quick and straightforward. The long-lasting Moon White finish is both stylish and hard-wearing. And the SpeedClean silicone nozzles mean any limescale building up on the aerator can be cleaned off with just a wipe. Just wipe down with a dry cloth – the ultra smooth surface finish is scratch resistant and ensures a lasting luminous sheen. You'll save plenty of time cleaning while your tap always looks shiny and new. Save time on the installation of your tap with GROHE QuickFix Plus. Consisting of fewer parts, our new system makes the installation process quicker and easier than ever. You'll have this tap mounted in the blink of an eye. The easy installation system comprises only a few parts and is very easy to use. Coming with flexible hoses and a clear set of instructions, you'll find the installation of your new tap is really simple. Indeed, the name says it all: with the SpeedClean technology, you'll have limescale removed from the spout in the blink of an eye thanks to a nozzle made of silicone. A quick wipe with your fingers is all it takes to remove any limescale deposits, saving you a lot of time and effort!